enabling rear two to be tight to block. Tight spaces…large tubes. One problem compounds another. How can you solve these problems? Even in older cars and trucks which have more open space under the hood than today’s vehicles, you often find issues of conflict between the steering system, accessory brackets and other underhood components. This is compounded with engine swaps so common with performance enthusiasts today -- such as a big block Chevy in a ’55 Chevy or an LS-series engine in a Mazda Miata -- and their quest for more power, or just to have something more unique. Another problem is bending the tubing. A rule of thumb for bending tubing without kinking is the radius of the bend cannot exceed the diameter of the tube. For example, to bend a 2” diameter tube, the radius cannot be less than 2”. And, as the tube is bent, the outer portion of the tube is stretched, thinning the wall thickness. 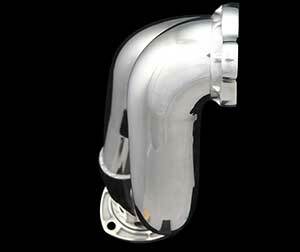 This is a problem with the turn-out of the exhaust port, where the exhaust gases are at the highest temperature and velocity. The high temperature gas, acting on the thinner sidewall will eventually weaken the header. Realizing these problems, the engineering team at Ultimate Headers created a unique solution to address the problem. That solution is an engineered stainless steel investment casting bend, which would create the turn with a radius much tighter than the limited traditional bending process. The investment casting also holds the desired wall thickness uniformly from end to end. 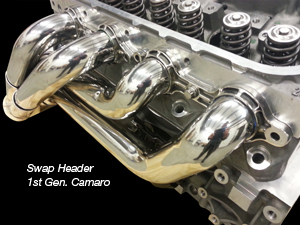 The result, more compact headers, keeping the exhaust system in a narrower space envelope! The result -- BIG TUBES for TIGHT PLACES! 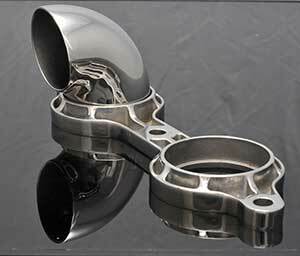 Holds the header tubes in a compact area, very close to the engine block.